Ms. Cupcake » Ice Cream Weather! Ms. Cupcake > News > Cupcake News > Ice Cream Weather! We at Ms. Cupcake are loving this gorgeous weather we’re having at the moment! There’s nothing better than sitting outside and soaking up some rays with your friends with a tub of ice cream to cool down! We’ve got so many great options at our shop, so here’s just a few of what’s on offer. 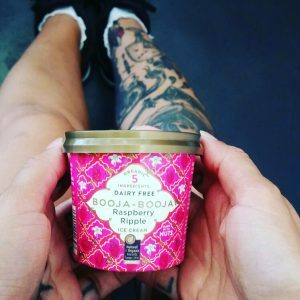 First up, we love the range of Booja Booja ice cream flavours and one of our favourites has got to be Raspberry Ripple! We’ve got loads of small tubs, perfect for single portion size! 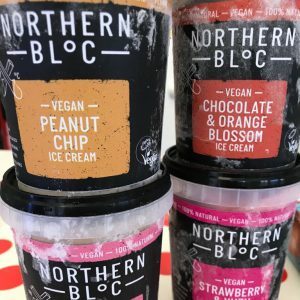 Or how about grabbing a tub of the delish vegan range of Northern Bloc ice creams! These are perfect for sharing, so grab some spoons and get passing that tub around! Prefer cones to tubs? We’ve got ya covered! 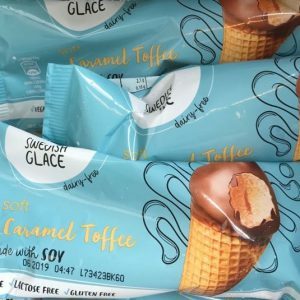 The Swedish Glace Toffee Ice Cream cones are always stocked in our freezer, so you can be sure to find some at our shop! 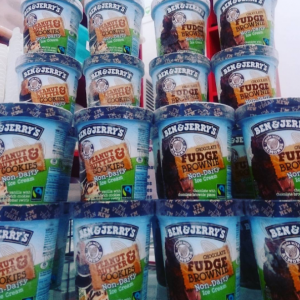 Oh, and not forgetting Ben & Jerry’s range of vegan ice creams! Family size and single portions are both available at our shop! This entry was posted on Wednesday, June 27th, 2018 at 3:58 pm and is filed under Cupcake News. You can follow any responses to this entry through the RSS 2.0 feed. Both comments and pings are currently closed.